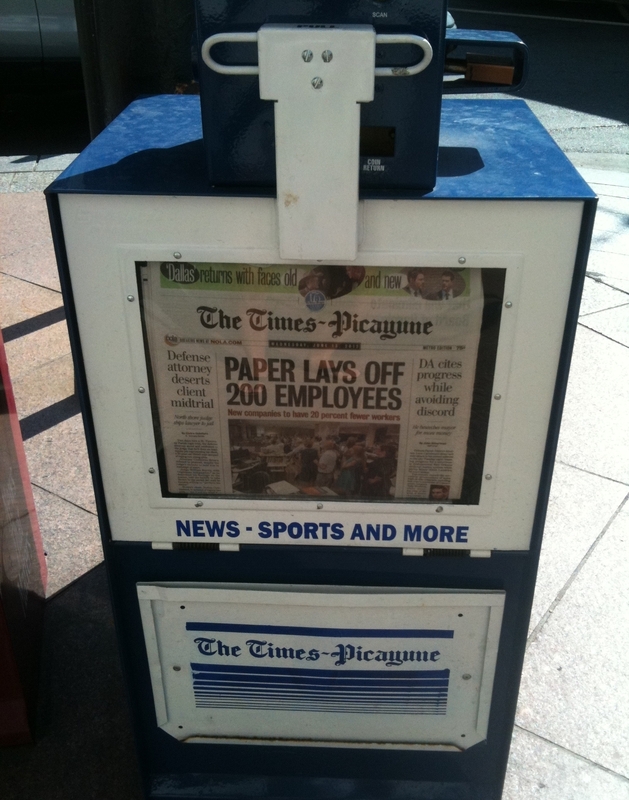 A New Orleans newspaper stand holds copies of Wednesday's Times-Picayune, which announced layoffs for 200 employees. A recent rally to preserve daily publication of the Times-Picayune featured high-profile musicians including Kermit Ruffins, whose sang a jazzy tune invoking the name of the 175-year-old paper. It's part of a campaign launched by New Orleans' most prominent residents and powerful leaders to save the Times-Picayune, a cultural institution in a city that gives high credence to tradition. "It's a morning ritual," said Constable Lambert Boissiere, a former city councilman and state senator. "You know, you get the paper, get your cup of coffee, have you a little breakfast or whatever, paging through the articles you want to read. Then you had the conversations at lunch about the things you read in the paper. "So that's going to be gone," Boissiere said. "I can't imagine myself and my friends sitting in front of the computer every morning, going through the different sections to read the articles. I don't see that happening." The cuts at the paper are part of a restructuring by Advance Publications, a Newhouse company, that will shift to three-day print editions and an emphasis on online news. But more than a third of New Orleans residents don't have Internet access, raising questions about how poorer and older citizens will keep up with news or even the local obituaries. Rituals aside, Boissiere said, the timing is terrible. "We finally cleaned up our act since Katrina. We got business coming back. Our athletics things, with the Hornets and the Saints, we got a Super Bowl, we had Final Four, everything," he said. "We're getting to be a big city again. And then to lose a daily paper, I think it's a bad signal affecting the growth of the city." Concerned civic leaders have banded together to put pressure on Newhouse to rethink its plan. New Orleans Mayor Mitch Landrieu said the city's reputation is at stake. "You know, if you go from seven days to three days, you look like a minor league city," he said. Jim Amoss, the Times-Picayune's editor and a native New Orleanian, said he grasps "the grief over what people think will no longer be there." He said the organization will continue to do justice by the community. "I know these are just words at this point," he said. "Our intention is to preserve the news report, investigative journalism, our chasing after corruption in Louisiana." Amoss said economic upheaval in the news industry is something that every regional newspaper must confront. "The one way we've chosen not to come to terms with it is by simply atrophying, by watching our print ad revenue, which is still strong, erode year by year as it will and as it has, and by having to chop off limb by limb of our newsgathering strength without having any strategy going forward," he said. But if this week's layoffs are any indication — 200 in New Orleans and 400 in Alabama (at the Advance-owned Birmingham News, the Huntsville Times and the Mobile Press Register) — more than a few limbs have been amputated. 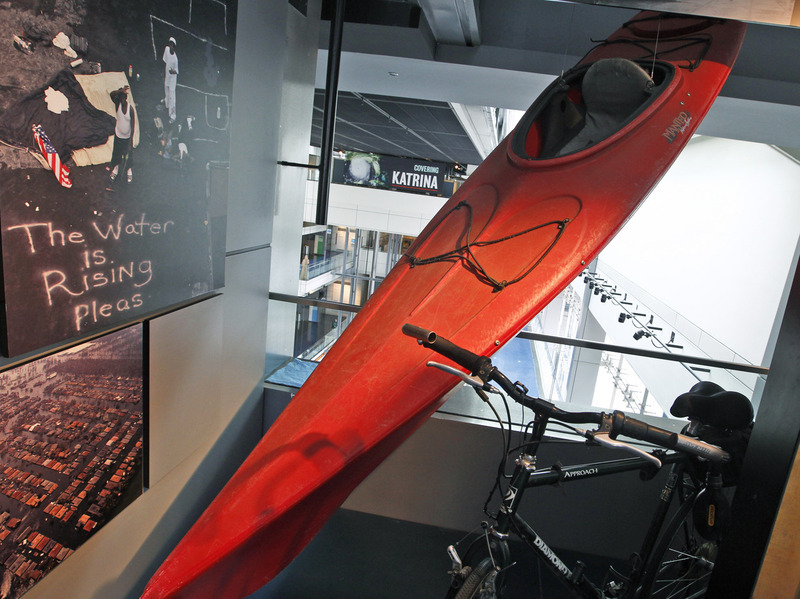 A kayak used by Times-Picayune photographer John McCusker to cover Hurricane Katrina is displayed at the Newseum in Washington, D.C., in 2010. McCusker, who worked for the paper for 25 years, is being laid off. John McCusker, who has been a staff photographer at the Times-Picayune since 1986, lost his job in the restructuring. "The main thing is I'm sad for this city," he said outside a local bar where laid-off workers met to commiserate. "You take away the Times-Picayune, and there are a bunch of police officers that were on the Danziger Bridge that would still be on the streets today. "You take away the Times-Picayune, and Aaron Broussard would still be president of Jefferson Parish. The watchdog role of this newspaper cannot be underestimated." McCusker was talking about how reporters exposed corrupt politicians and even a police plot to cover up civilian killings after Hurricane Katrina. The paper's storm coverage earned a Pulitzer Prize. Restaurateur Ralph Brennan is part of a group of Times-Picayune advertisers considering whether to pull their spending in protest. He's disheartened by the list of seasoned journalists who are leaving, including the paper's restaurant critic, Brett Anderson. "They have an outstanding staff, many of them who've been there a long time. Brett Anderson is one of them. And Brett has a national reputation," he said. "He's very well-respected in the food journalism community, and to lose him is a great loss. And this is a food city!" Brennan's restaurants are serving special drinks like Picayune Punch, with a portion of proceeds going to help those who lost their jobs. He and other business leaders are now looking for alternatives. "I keep hoping that somebody, an entrepreneur out there, will find a way to get us some daily news and maybe build a newspaper," he said. Three-day publication is set to take effect in the fall.